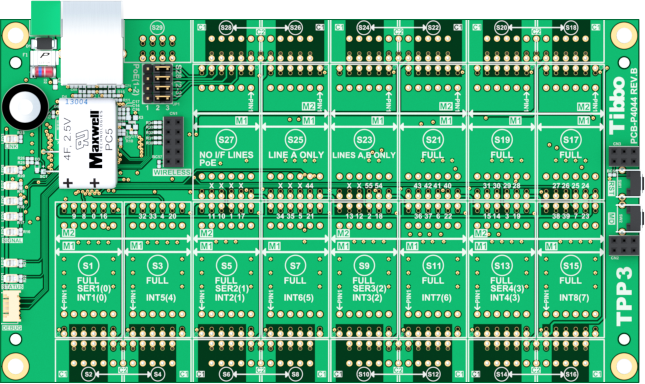 Size 3 Tibbo Project PCB (TPP3) runs Tibbo OS and is programmable in Tibbo BASIC and Tibbo C.
TPP3 is ideal for applications that require no human-machine interface (HMI) while calling for a significant number of I/O lines and/or functions. Offering 7 tiles for a total of 14 "M" and 14 "C" sockets, the TPP3 can be used to construct devices with up to four full serial ports, up to 25 relays, or up to 47 opto-inputs, PWM, or open-collector outputs. lcd — controls graphical display panels.